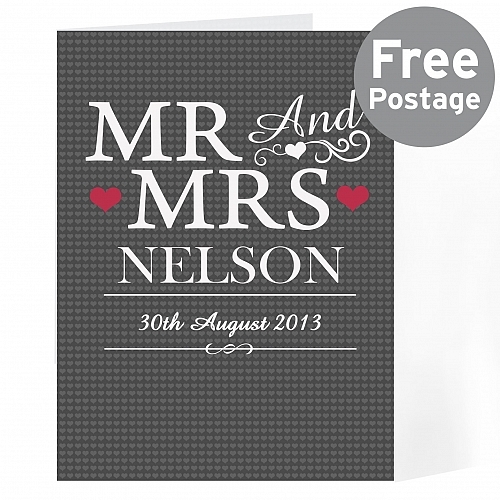 Personalise this Mr & Mrs Card with a couples surname up to 15 characters and date on the front up to 20 characters, and add a message over 5 lines on the inside, 20 characters per line. 'Mr and Mrs' is fixed.Surname will appear in capitals as standard.NOTE: Due to the font type used please refrain from using all capitals in your personalised message on line 2-7. If the message is all in capitals you will find the personalisation extremely difficult to understand and may even result in personalisation being missed off the product. Many thanks for your cooperation.All Cards come in a brown outer envelope with a Plain White envelope inside. All cards measure 185mm x 132mm.Our great value cards include free standard delivery.Card orders received before 1pm will be dispatched the same working day.Perfect for Wedding, Anniversary.